Trying to figure out when to post on Instagram can puzzle even the most social media savvy among us. – What are my followers doing? – Are they even checking Instagram right now? – Where in the WORLD are they? Your mind be start whirring into overdrive that it can be hard to decide what to focus on, let alone when to actually post! Stop guessing, why it’s important to know when to post on Instagram. 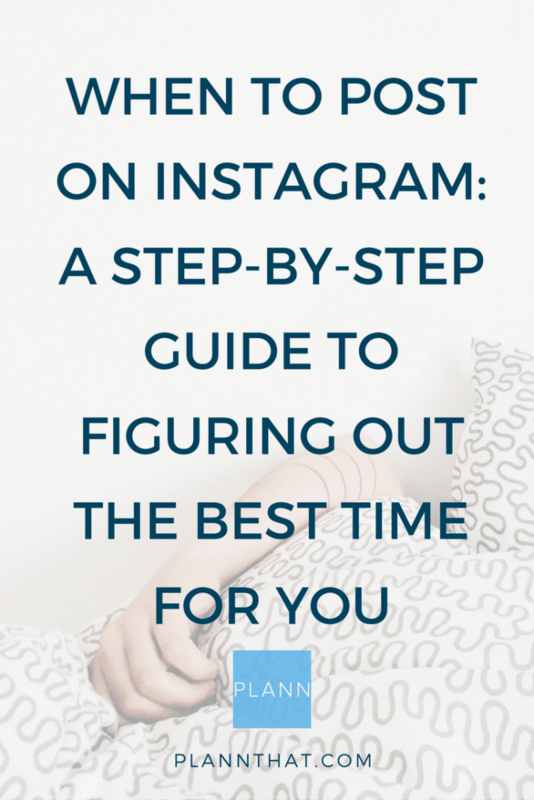 Finding out your best time for when to post on Instagram is crucial for your success. You want to be able to stay on top of algorithm changes by engaging with your community when they’re active on the platform, instead of disappearing in their feeds. If you post when your community are active and your post gets engagement quickly after it goes live, Instagram interprets that as a sign of the quality of your content and pushes your post up the feeds and in front of more eyeballs. It’s a win-win all around! With Plann’s new Instagram analytics and performance features you can find out which time is best for you to post every day of the week, based on the success of your previous posts. The key here is testing to discover what times work for your community and what don’t – Instagram is a marketing channel after all, and marketing means testing! Not sure where to start? Here’s our step-by-step guide to figuring out when to post on Instagram. First thing’s first, all experiments need parameters (measurable and specific goals) to ensure the most accurate results possible. Plann tells you the best daily time to post based on your last 30 days of activity, so try to stick to a whole month of posting every day to get the most helpful results from this test. Lab coat aside, now it’s time to whip out your magnifying glass and investigate. Hopefully you already have an idea of you your followers (or ideal followers) are and what they are like. Either way, it’s time to ask some questions about their daily life and online time, to figure out what times you should be testing for your Instagram posts. When are they likely to be on Instagram? Put yourself in their shoes – are they working professionals scrolling on the commute home at 5.30pm? Fit young things up and out for their morning workout at 7am? Or mums of young kids collapsed on the couch after the kids are asleep at 8.30pm? You can head to Instagram’s native analytics to see when they are active also – just head hit the ‘Insights’ icon from your profile, then scroll down to the ‘Followers’ section, then toggle through the days to see the average times your peeps are most active on a typical day. Another thing to consider is time zones – where in the world are your community located? Maybe you know from your Facebook page, or your website stats, where most of your traffic comes from. Not sure? Again, you can jump into Instagram’s Insights to see. Just head back to the Followers section, then press ‘See more’ and scroll down to see your Top Locations, by cities and countries. The more closely you look at your own audience and their behaviour, the more tailored your testing plan can be to your account. However, it might also help to consider some of the more general research that’s out there to see if anything seems relevant to you, or helps guide you if you feel totally lost! – Try posting outside of work hours (like in the early morning or in the evenings) or when people are taking their lunch break- Test weekends v. weekdays to see when your audience are most active, and keep your more important posts (e.g. announcements or promoitions) to those peak engagement times- Hubspot released an infographic in 2016 that found the best time to post on Instagram was any time from Monday-Thursday except between 3-4pm, have you learned that’s the same for you? Now comes the fun part! Use our visual planning App Plann to visually design your month’s worth of content. Drag and drop your images, write your captions, sort your hashtags and schedule your posts so you can sit back and relax later. Don’t forget: Because Plann’s analytics calculates your best time to post for each day of the week, it can only be done based on your existing activity. Make sure you try a different time each day across the whole month. For example, for each of the four Thursdays of the month, make sure you schedule your posts at different times to test it out. Say, 8am, 5pm, 8pm and 10pm. If you accidentally post at 8pm every Thursday for a whole month, you won’t have anything to compare it with! 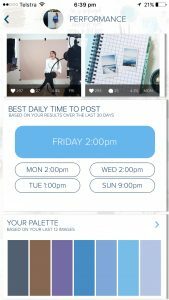 What are the benefits of scheduling Instagram posts in advance? Learn how it can grow your account faster! After a month of daily posting and testing different times for each day of the week, check back in to see what your best times were! These results will be super personalised, which is perfect for figuring out when to post on Instagram – the time that’s right just for you! Try posting at these times for a few weeks and see if you notice an increase in engagement. Feel free to repeat this testing experiment whenever you feel like things are getting stale, or your audience might be losing interest. It could be your content, or it could be the time you’re posting. It’s important to also consider things like daylight savings and seasonal changes, as these can have a massive impact on our daily behavioural patterns. Is there someone in your network who shares the same target audience as you? They may not be a direct competitor, but someone who you know would regularly speak to the same people? You could always turn on your post notifications to see when they post on Instagram, and add those times into your own testing matrix! Time for Your Own Tests! And there you have it, time for you to get testing! Have you figured out when to post on Instagram yet, or better times than others? Keen to start planning and nail when to post on Instagram for your brand? Download Plann now from the iOS and Android stores to get ahead with your strategy with visual planning, performance analytics, image editing and more! PreviousPrevious post:Entrepreneur guilt: what is it and how can I overcome it?NextNext post:Automatic Instagram Scheduling: Are you risking your account by using the wrong tool?